Cee’s Fun Foto Challenge – Hats and my hat-phobia ! I love hats, but will not don on one easily. I admire people wearing hats, but will not do so myself. I envy those that carry a hat with elan, but will not place one on my head. I am just too concerned about my hair getting messed up, or fall flat around my face ! A phobia of a sort ? Perhaps…….so I coined the word ‘hat-phobia’. So, grammar pundits, don’t kill me ! 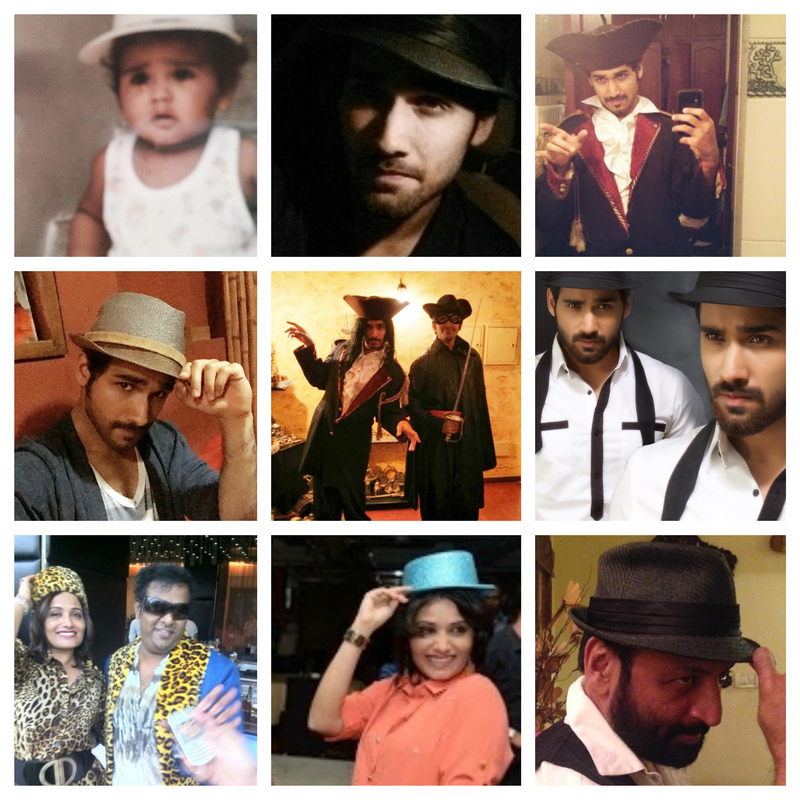 The two pictures you see me in hats in this collage – I was compelled to wear them !! Most of the pictures above are of my son (he is an actor), the first one in babyhood. The second and fourth being simple hat-moments, the third and fifth at a theme party. Sixth for a photo-shoot, captured by Sudarshan Balaji, an ace photographer of Chennai. Seventh and eighth – yours truly and the last one, of my husband. I have pictures of some other friends too, but a tad unsure if they would appreciate them being displayed here. 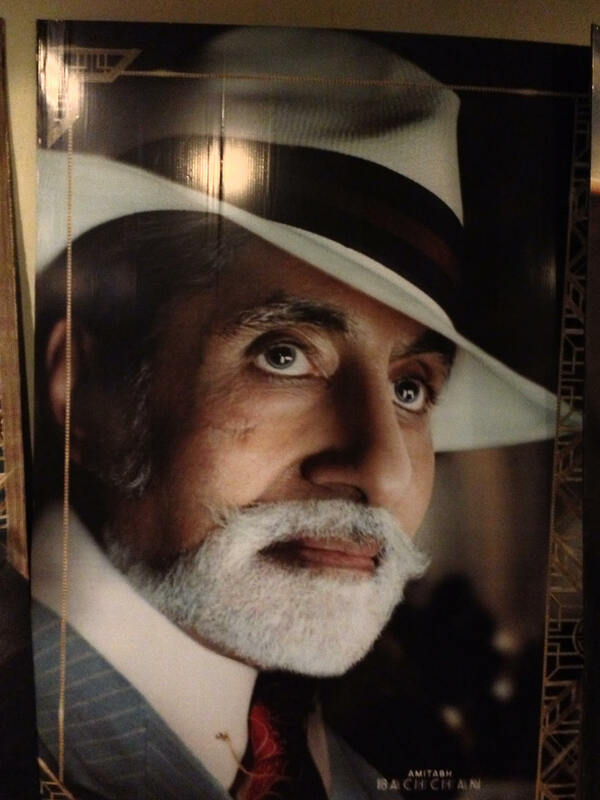 I hero-worship this legendary actor of India, Amitabh Bachchan. I really don’t remember where I clicked this shot. In admiration of the way he has styled his hat ! I have taken the liberty to deem this turban, a hat. Simply because it is pre-wound as a head-gear for this north Indian statue. Wearing this kind of turbans is common among Sikhs. Turbans (hats) have also been often worn by the Indian nobility, regardless of their religious background. These days, it has become a common practice for bridegrooms and their male relatives, to wear turbans (hats) during weddings in India, irrespective of their religious faith. Another liberty taken. 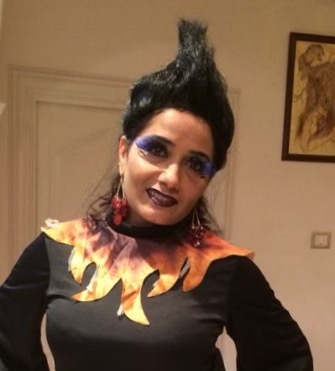 A wig-hat as it is termed for a costume party. You can see strands of my hair underneath the hat, So hat it is ! An idea just dawned upon me. I could perhaps carry a can of dry-shampoo in my handbag and plump up my hair, in the event of a hat flattening my bouncy hair. I am going to bring out my wide-hats and await another challenge, for the hat-challenged !!!!!! 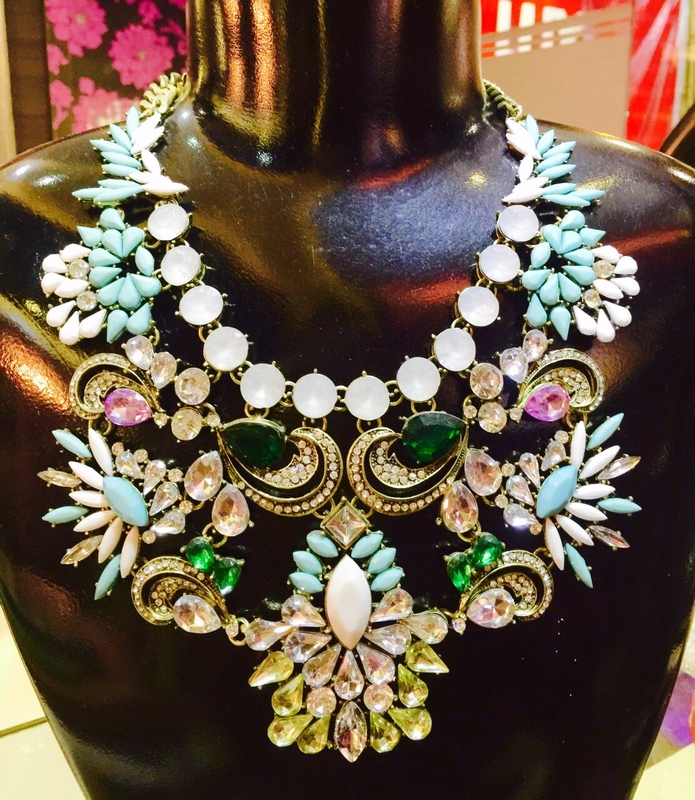 Frankly , it’s the age of cocktail or fashion and costume jewellery and who is behind it all ? Don’t you think its being largely driven by the apparel industry ? I mean , look at the zillion styles of clothing. We need accessories to go with them. There aren’t many rules in fashion any more. Mix , match and more mix n match. Its bonanza for the accessories industry too ! And we are not complaining ! 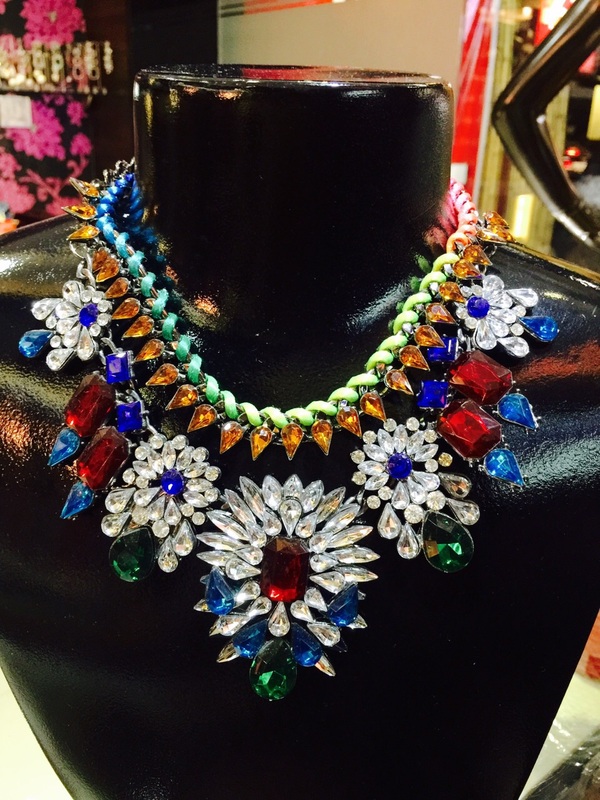 Check out these eye-catching cocktail necklaces. The less is more concept is working wonders in the fashion industry. Volumes have the biggest say and volumes are driven by pricing. So , we , consumers get to buy more , wear more. The keepsake or the collectible jewellery , the real fine precious jewellery is living up to its terminology and is being relegated to safe corners more and more. Else , we , fashionistas would have little jewellery to go with our expanding wardrobes. 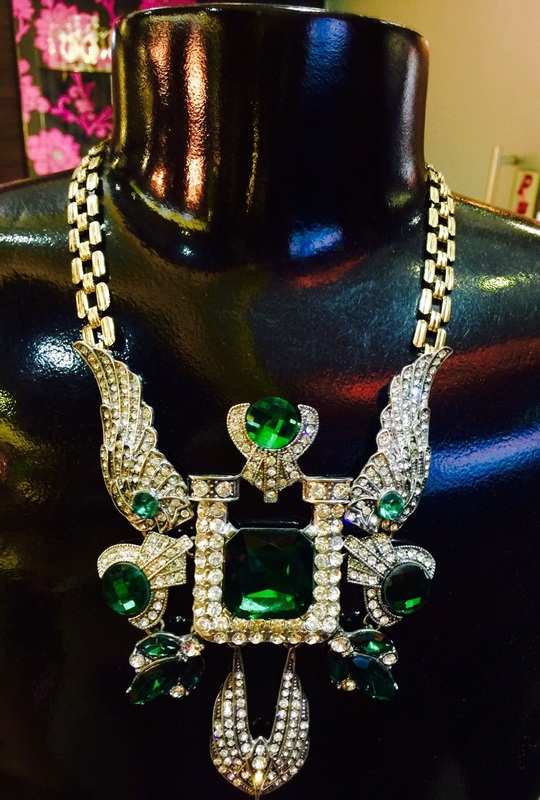 Fashion/Costume jewellery came into being in the 1930s as an inexpensive , disposable accessory meant to be paired with specific styles and since then has gone on to sweep the imaginations of designers and consumers alike. Then came the machine-age , the Industrial Revolution and the timing was perfect ! Making mass-produced jewellery affordable and stylish , precious gold-silver and gemstones making way for the more affordable metals and synthetic stones. That is not to gainsay heirloom pieces , but how often does one wear them these days ? 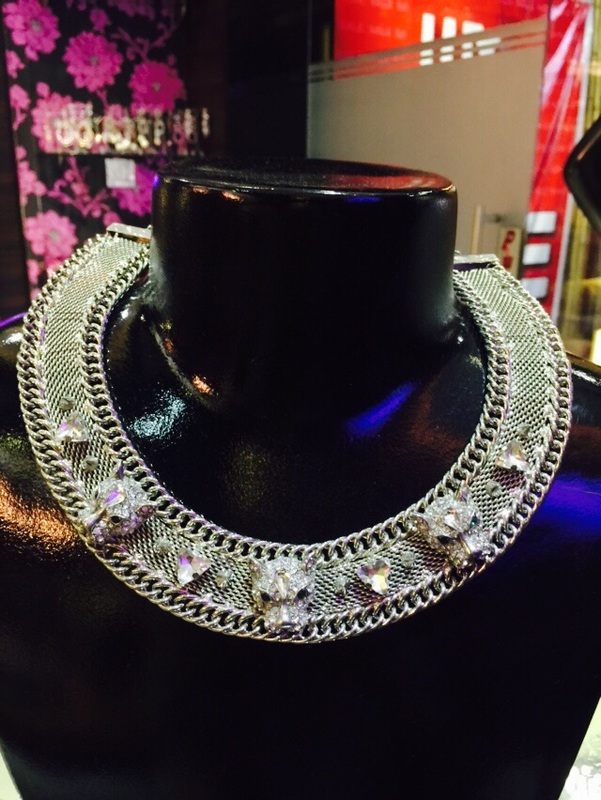 While the feel of precious jewellery is unsurpassed , yet , kudos to the fashion-jewellery designers ! They make us feel adequate and often indulgent. And Indians love jewellery anyway. 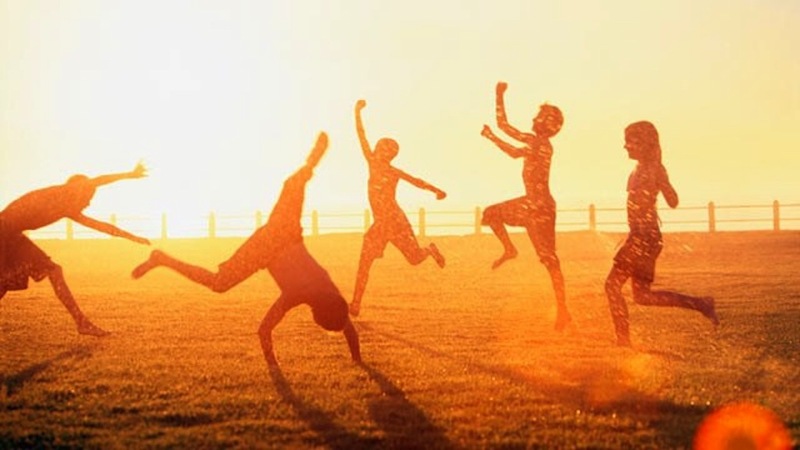 There is something else that we love more and emulate. Films ! While Hollywood influenced the rest of the world , our Hindi film industry fuelled the nouveau fashionistas’ urge to flaunt elaborate fashion jewellery akin to those worn by our sensuous heroines. 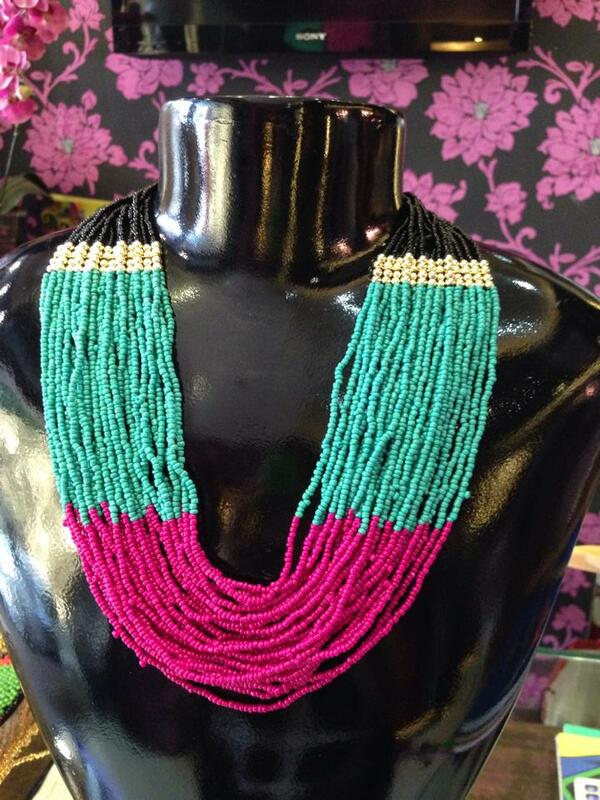 And we got more styles , more jewellery to choose from , from all over the world. 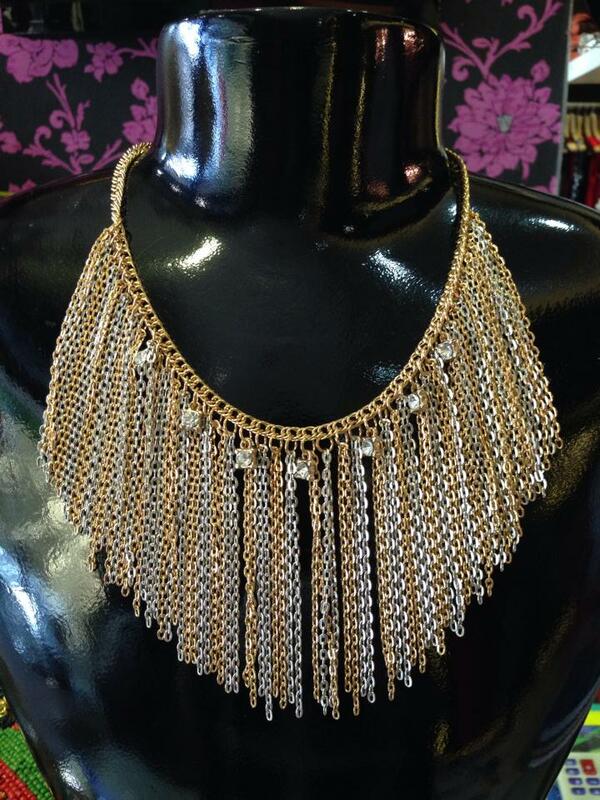 Here are a few stunning pieces of cocktail/fashion/costume jewellery. 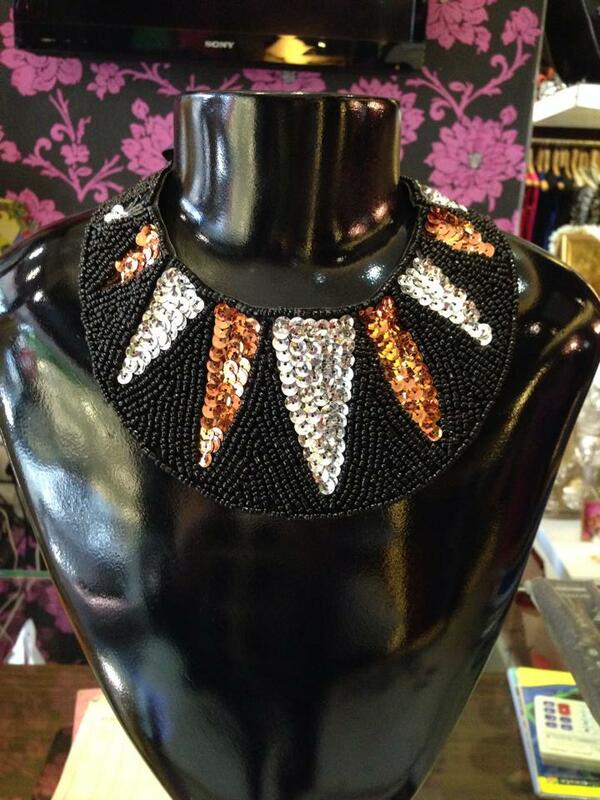 Fashion/costume/cocktail jewellery will only continue to get better and redefined in many more ways. 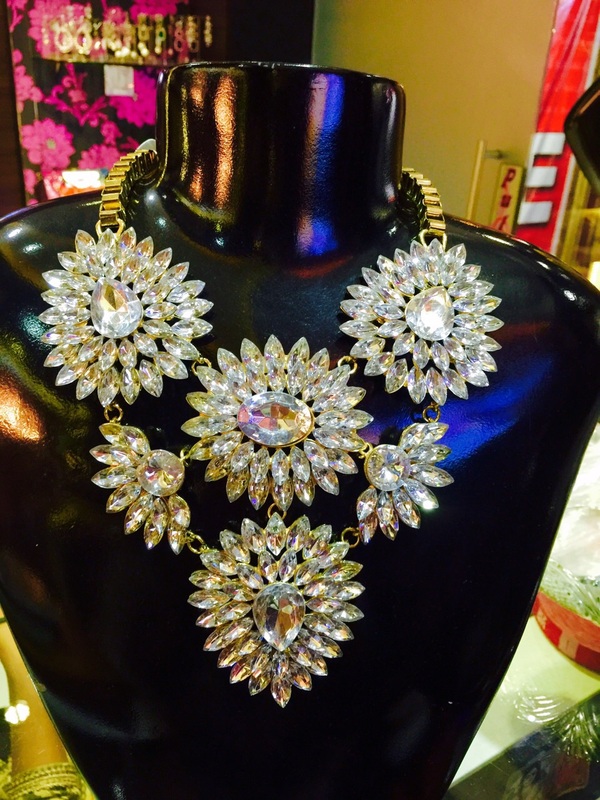 LUX214 has plans to expand their jewellery section to making it an exclusive boutique for fashion/costume accessories. 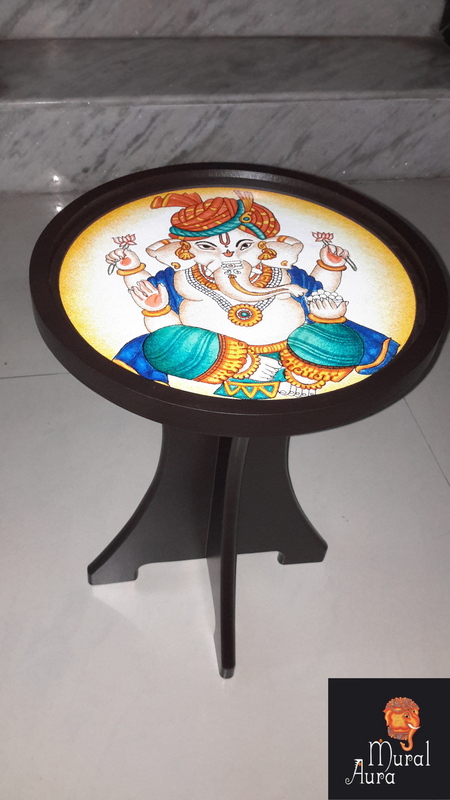 @ LUX 214 , 214 TTK Road , Alwarpet , Chennai 600018 , Tamil Nadu , India. Tell us what you think , we are eager to hear. God’s own country is how Kerala , the state at the southern tip ( south-west ) of India is referred to very often. It’s also called the land of temples and churches. Lapped in verdant surroundings , I guess the state of Kerala offers serenity , the much-needed attribute for spirituality. It’s also the land of colours if you go by the Kerala mural art , so typical of the state. Kerala mural paintings are frescos that depict mythology and some legendary heroes of the bygone era. 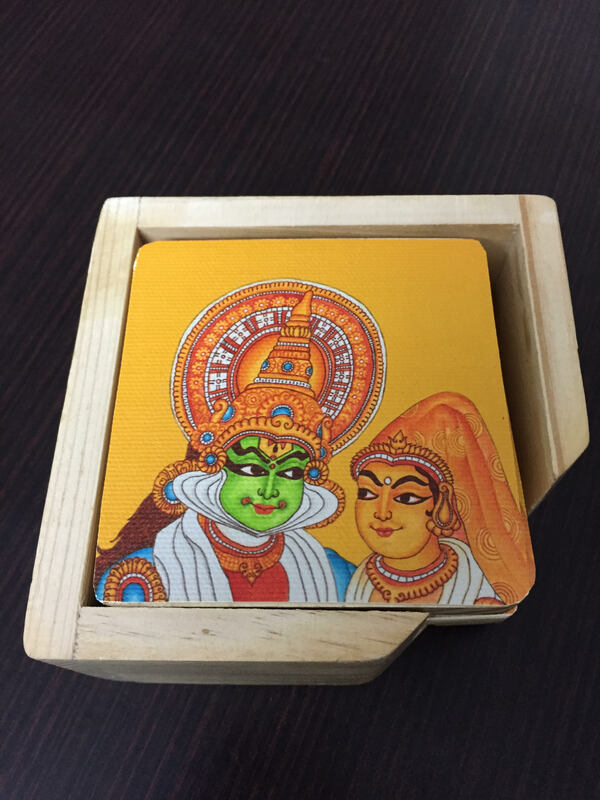 The art dates back to the 9th – 12th century CE , originating in the temples , churches and palaces of Kerala , sometimes being referred to as temple art too . Mural art was expensive , as you will see later , and hence the patrons of the art were predominantly kings. Patronised by the royalty , the art most naturally found its roots in subjects connected to religion and spirituality. Art of that era had no place for conflicts and causes , unlike today. So , the walls of palaces and places of worship became the canvas for mural art. The common man , like you or me , was far removed from owning the murals then , due to their high cost … and we shall see why ! Creating murals was and is time-consuming and laborious. Small changes have been made to suit today’s times in the process of mural art ; we’ll get to that in a bit. Back in history , the artists were mandated to follow certain religious customs before taking up the painting and conform to them till completion , as the subject of the art was primarily the gods. The wall was first coated with an admixture of powdered limestone , sand and gallnut soaked in water. Upon drying , a second coat of limestone mixed with sand , this time a finer mix , was smeared..Not done yet , a third coat would follow , this time around , a medley of finely powdered limestone with tender coconut water. The latter was applied twenty-seven times in between the drying. The wall would then be left to dry completely for thirty days , after which the artist could take up his brush and palette. Just writing about it is tiring me out ! Its made of arrow grass. A bunch of arrow grass , tied and covered with banana leaf was cooked in buffalo milk. The finely cooked grass was then tied to the tips of bamboo sticks ( wonder how they handled cooked grass ). The tips of such a bunch of arrow grass were then shaped to form brushes . Whew ! The medium for painting ( colours ) were pigments procured from natural sources. Just five colours called ‘panchavarna’ go into mural paintings even today , though the present generation of artists have resorted to acrylic colours , simply due to the astronomical costs of procuring natural extracts for the hues. Yellow ocher and red ocher obtained from a type of mineral earth oxide , ‘Vettukallu’ , found mostly in North Kerala. Green obtained from the leaves of a plant called ‘Indigofera’. Blue obtained from the lazurite mineral ‘Katta Neelam’. Black obtained from the lamp black , soot. For white , the background is left untouched. Mural art employs the science and psychology of colours in its choice to depict characters and moods. Green and blue to denote purity or divinity. Black for impurity and sin. FYI : The above three traits are classified into three attributes , ‘gunas ’ as laid down by the Hindu scriptures in that order : Satvik , Rajasik and Tamasik. The hallmark of a Kerala mural painting is the detailing and shading that go into it. Every square inch of the painting is painstakingly detailed by the artist , evident in the blending of the colours , the fine grading of the shades ( remember the five colours only ? ) , the intricate lines that define the curves of the characters in the painting and the light of play subtly brought out by the shading. All characters are curvaceous and well-proportioned. Some lines are created by joining tiny dots in close succession. I have been privy to this and its truly back-breaking ! 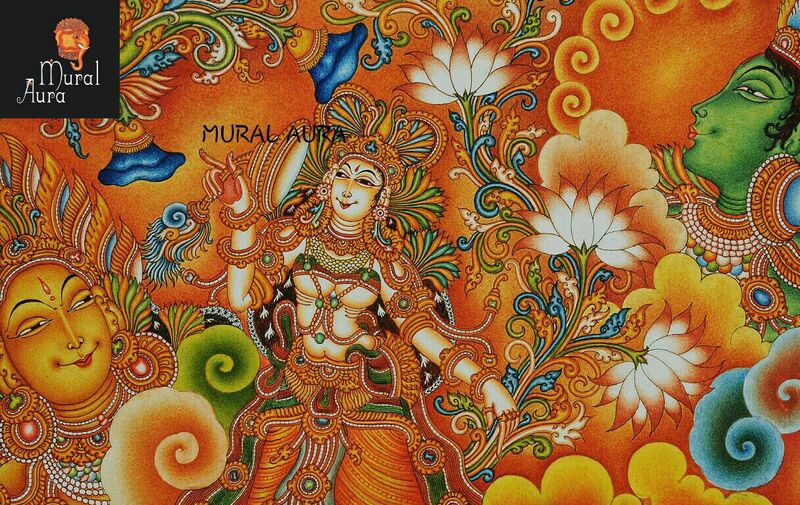 Mural Art from Kerala is distinguished by its emphasis on and strict adherence to beauty , clarity and symmetry , not found in any other form of mural art around the world. Have you seen ‘evil’ made to look beautiful ? You can see it here in this art. Evil not glorified , but beautified in keeping with the essence of the art. A demon is also painted in as great a detail as a god ! The quality of being evil is portrayed in the act being painted , never in the demeanour of the character , maybe just a hint of it. Proportion and pose are two other mandates for this type of mural art. Every part of the body of the characters in the painting must adhere to proportions laid down for the art. For instance , the neck is to be one-fourth of the face and so on. The same rule goes for depicting markets , animals , buildings etc. So much hard work and so much time go into creating mural art even today. 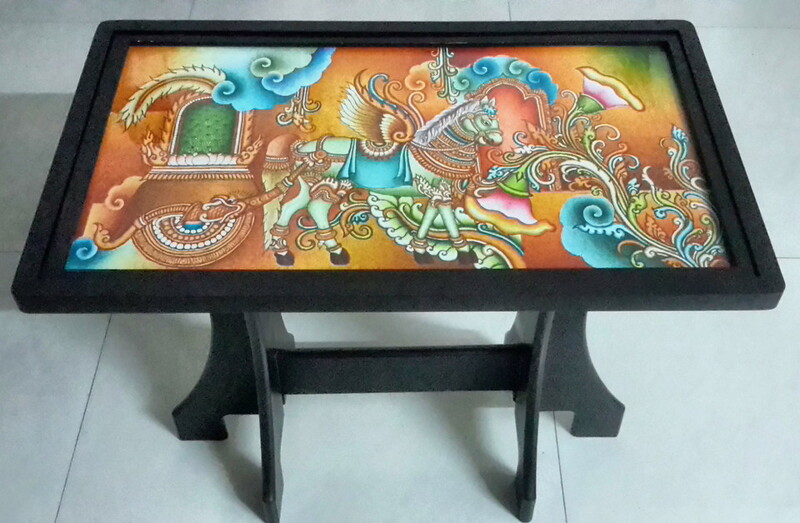 The artists of today have innovated and simplified it in various levels. Canvasses for the present crop of artists range from fabric to wood and the good old canvas. There are no more kings , there is not so much space. Some have embraced synthetic colours and brushes. The natural pigments do not have shelf life and there are no more makers of those arrow grass brushes ! 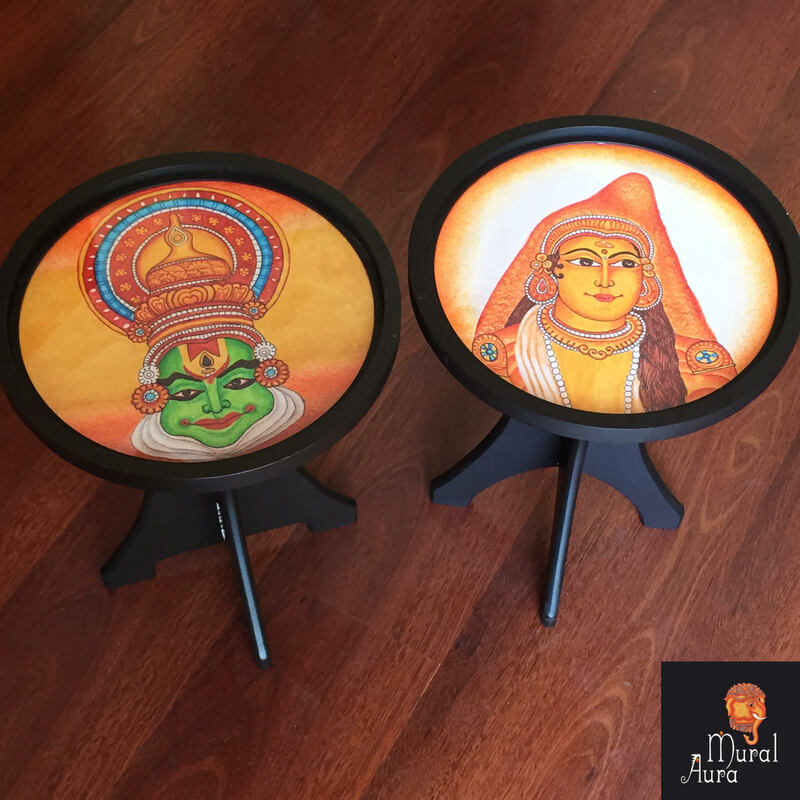 ‘Mural Aura’ , a family enterprise at Chennai has hugely popularized Kerala mural paintings in the city , elsewhere in India as well as countries abroad. 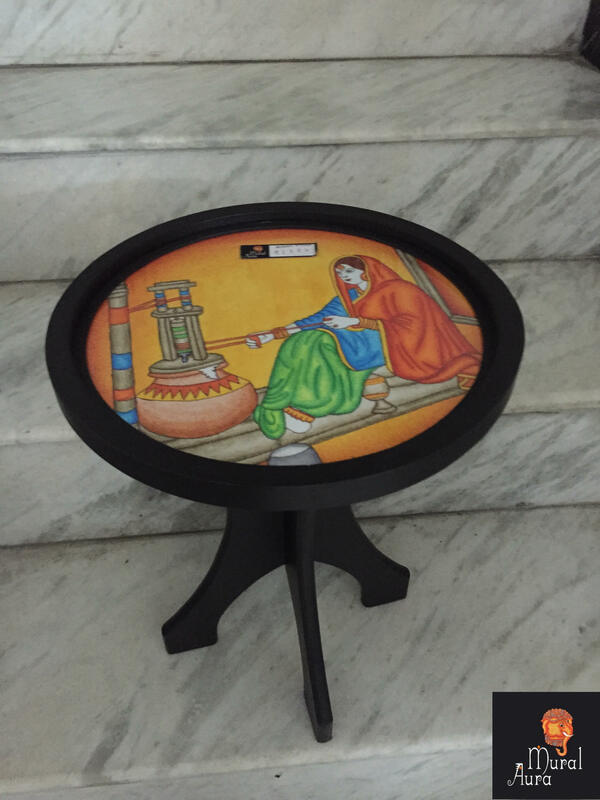 Two women , a mother , Malathy Lakshman , the artist , her daughter , Chandra Lakshman and her father , Lakshman Kumar came together to showcase the beauty of the art in all its finery. 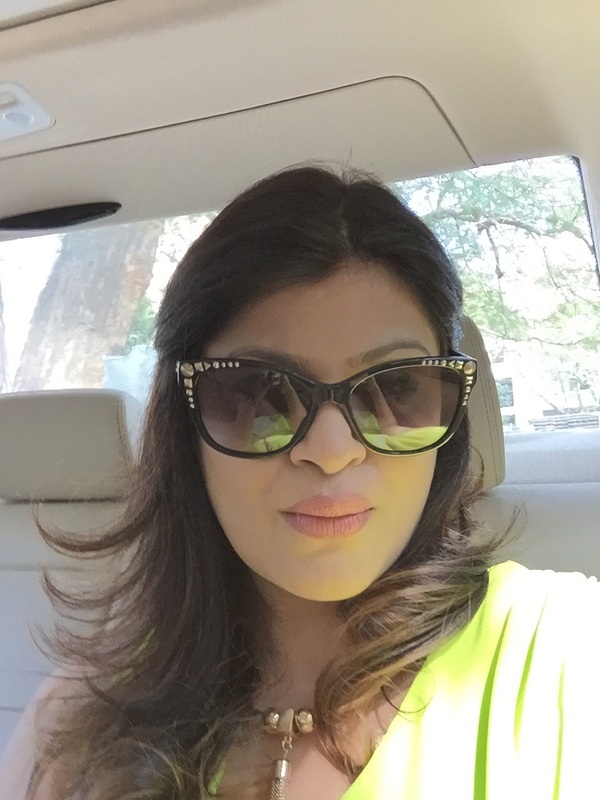 Chandra is an actor and a designer who adds creative inputs to the enterprise. Foyer tables , buddy stools , trays , coasters , lamp shades and wall hangings designed by Lakshman Kumar with stunning mural imagery are only a part of their product range. You want a hand-painted Krishna with a flute on your shirt ? Swan and peacock motifs on borders of a saree ? A mythological story on the pallu ? Mural Aura will love to do it all , merging art and fashion aesthetically. On silk and cotton only. Some of their customers not content with wearing the art on their bodies , spend time learning from them how to paint murals , so there goes training , another feather in their cap. Some painters transform the sun into a yellow spot , others transform a yellow spot into the sun. – Pablo Picasso. Mural Aura will transform the dullest of spaces into vibrant energy zones with their work. Respect for the creative trio ! 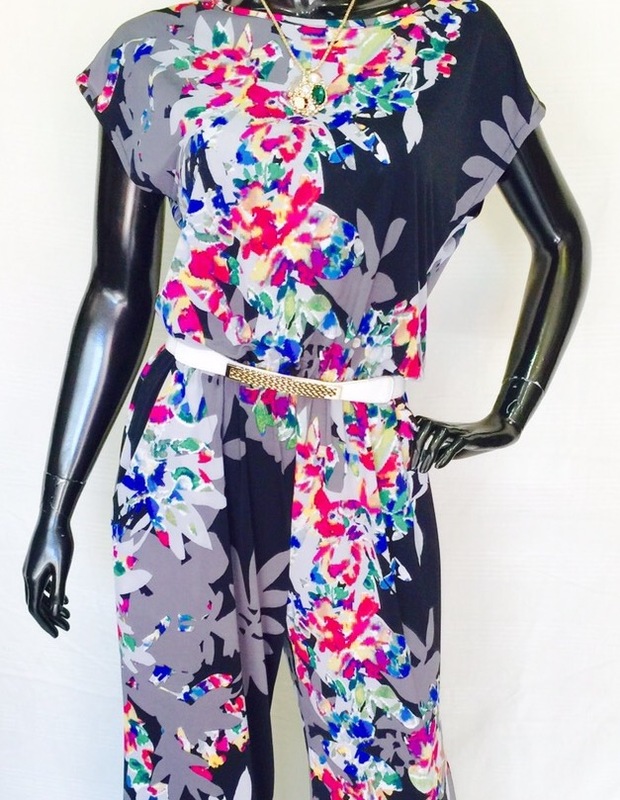 Jumpsuit has it all – cool for cocktails , fab for a brunchy date or a night out , and a perfect party dress ! No dress could get more versatile ! Well , wait , one could even trek with them on ! 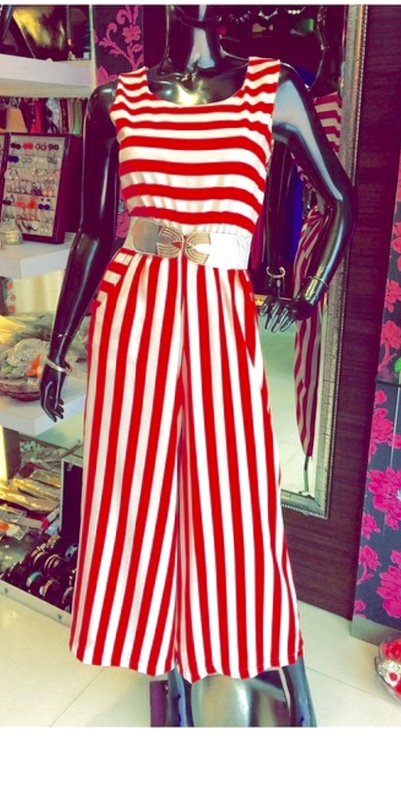 Head-turner stripes , club it with some attitude ! 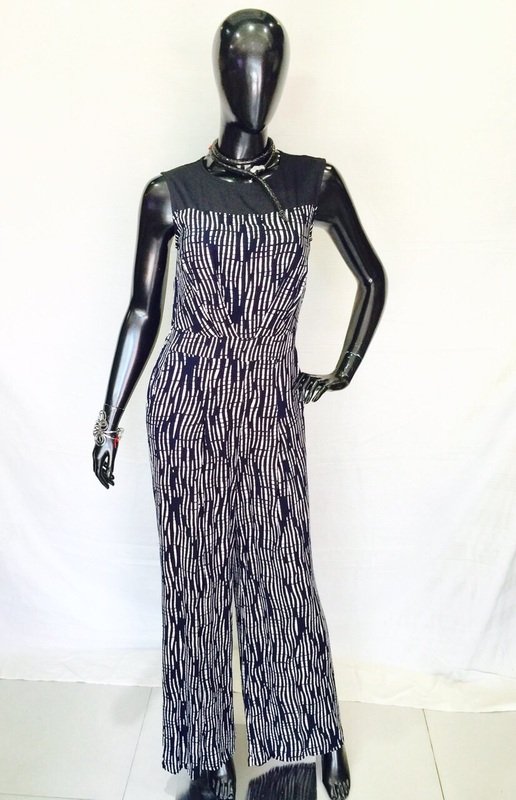 Classic white and black that never goes wrong , a Jumpsuit for all occasions. Comfort is the keyword in Jumpsuits , then and now. Its humble roots go back to being a one-piece garment for sky-divers and parachuters as the name suggests , designed to insulate , cocooning them from the freezing temperatures of the high altitudes. Those very functional ‘onesies’ have today redefined fashion , combining comfort and style. 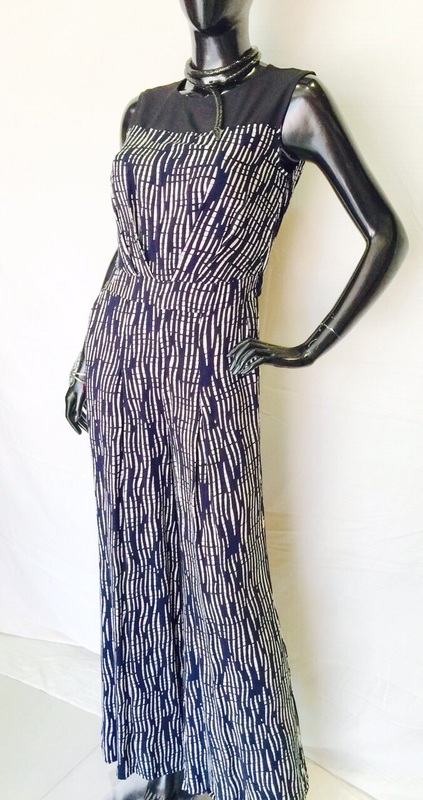 Somebody write an ode to jumpsuits , if it hasnt been done already ! 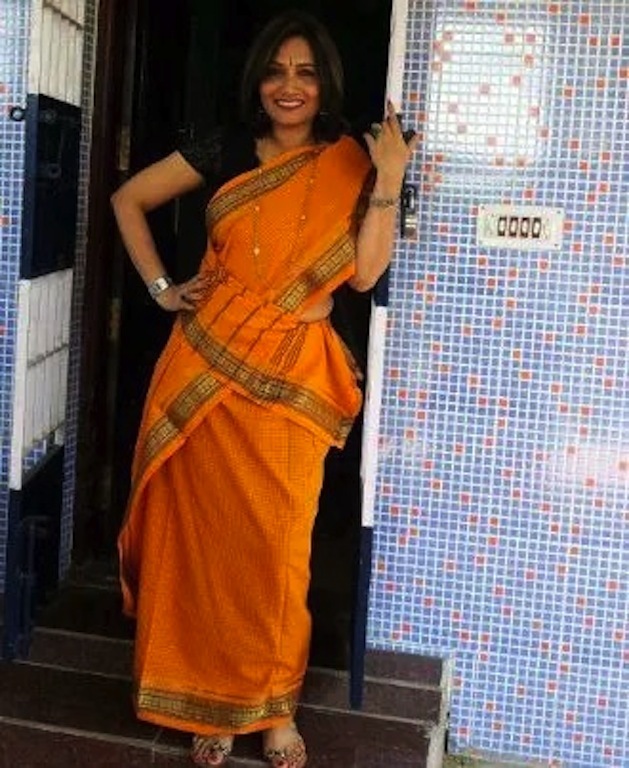 Orange is sensational , orange is symbolic , orange is not just a decorative colour in India , but is woven into our fabric of religion and culture. It is the colour of the enlightened , it is the colour of the ascetics , it is also the colour of the fashion loving generation. There is no dearth of orange in our everyday living , as we are wont to term it and we dont have to go looking for the colour in India. Here are a few pictures to annotate that and by the way , I love the colour. Who doesnt ? 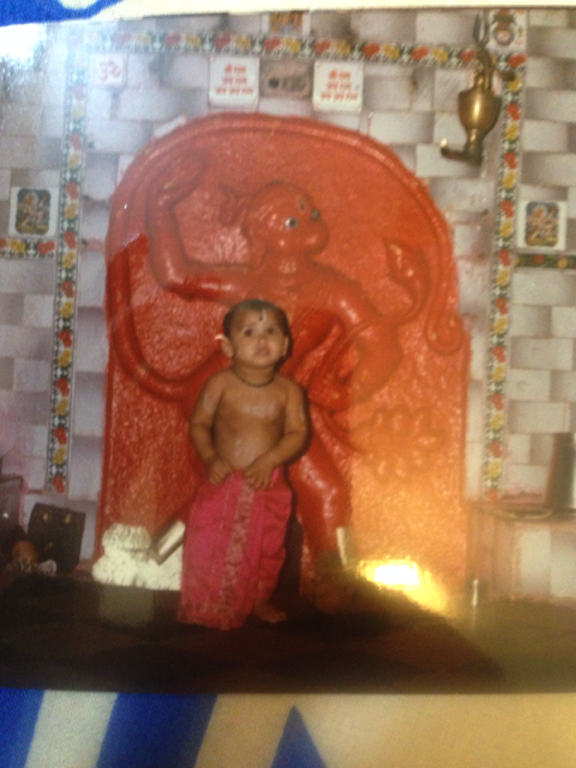 And here is a little boy , after a ritual , innocence personified as he stands in front of the image carved in stone of our Hindu deity Lord Hanuman in orange. For those of you interested in Hindu mythology and more about Hanuman , you can look for our epic books The Ramayana and The Mahabharata. This picture was taken in a temple in Nuggikeri on the outskirts of Dharwad. 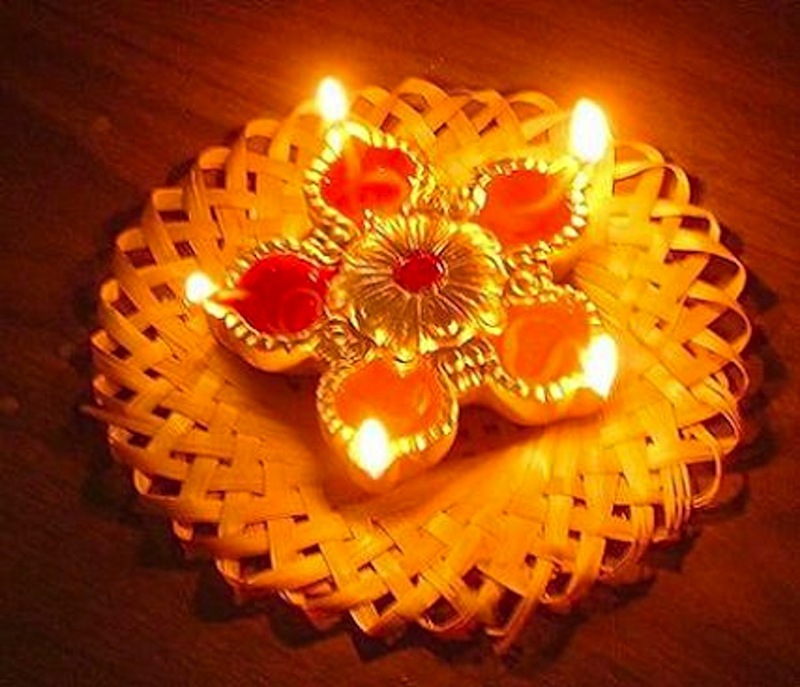 If we talk about our deities , then our lambent lamps ( diyas ) cannot be far behind. The warm orange glow of lamps lit during Diwali , the festival of lights brighten our homes in the months of September or October. This was sheer serendipity , just when I had planned my post in response to the Orange photo challenge , to find this spattering of orange on my way to work this morning. I have no idea what the statuettes signify , but as I said they came just in time. 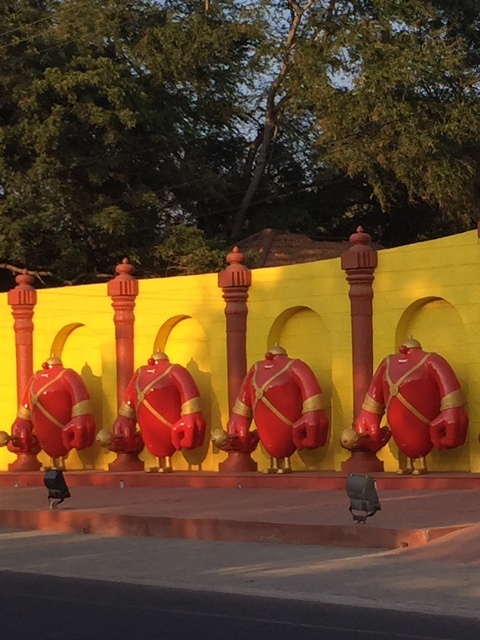 At the gates of VGP , an amusement resort in Chennai. Our villages and cities alike show fondness for the colour , very evident in this city-woman dressed as a village belle in an endearing shade of orange. 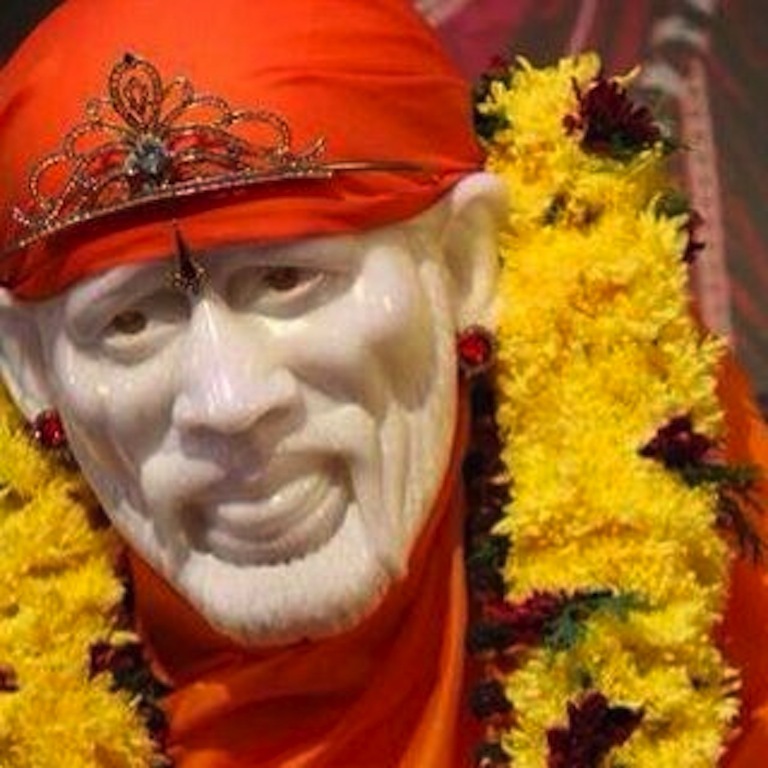 As I said the colour of the enlightened and the ascetics is clearly illustrated in the saffron colour robes of our Guru Sri Sai Baba. Even some of our foods are orange in colour. 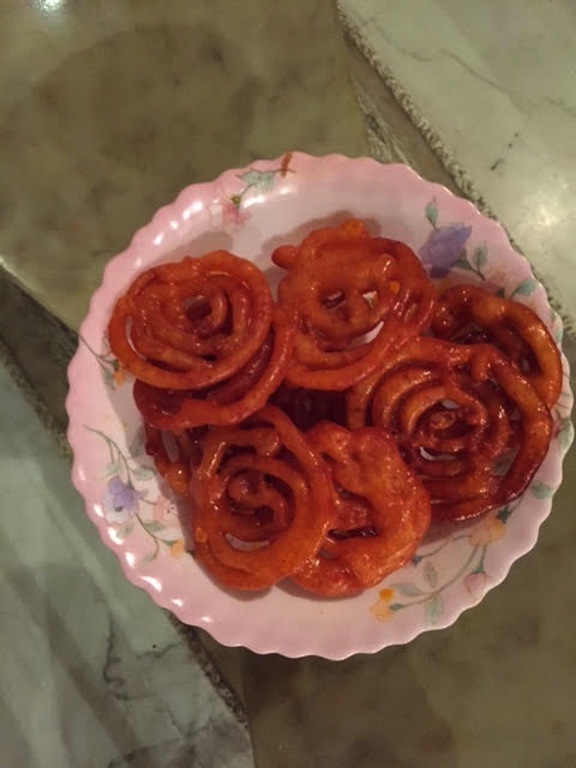 These are Jalebis , a yummy sweetmeat of our country. And finally , the orange of the dusk is for all of us , every land , every age ! Wish I could go back in time to my childhood to play in the mud and yet not mind the dirty feet or the sneezes from all the dust. 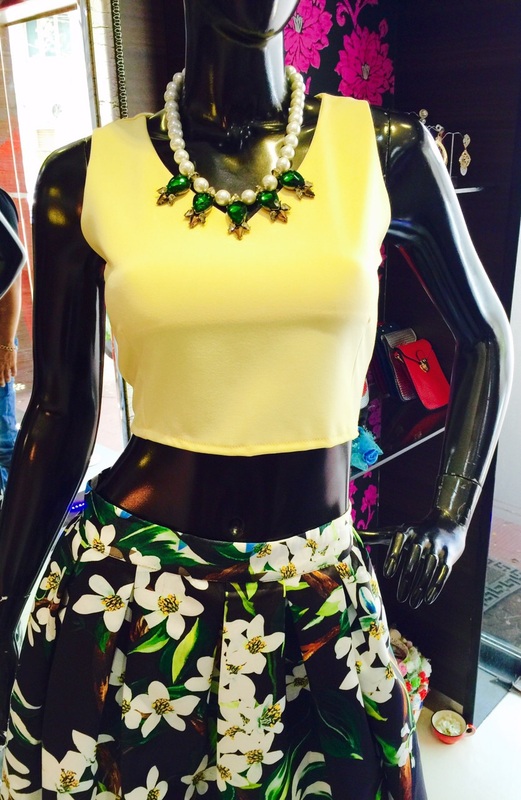 Crop tops with Skirt – Summer – Spring Fashion. I like this girl’s keen sense of fashion and her eye for details. And I like her line of clothing , LUX 214. I like her grit , her determination. 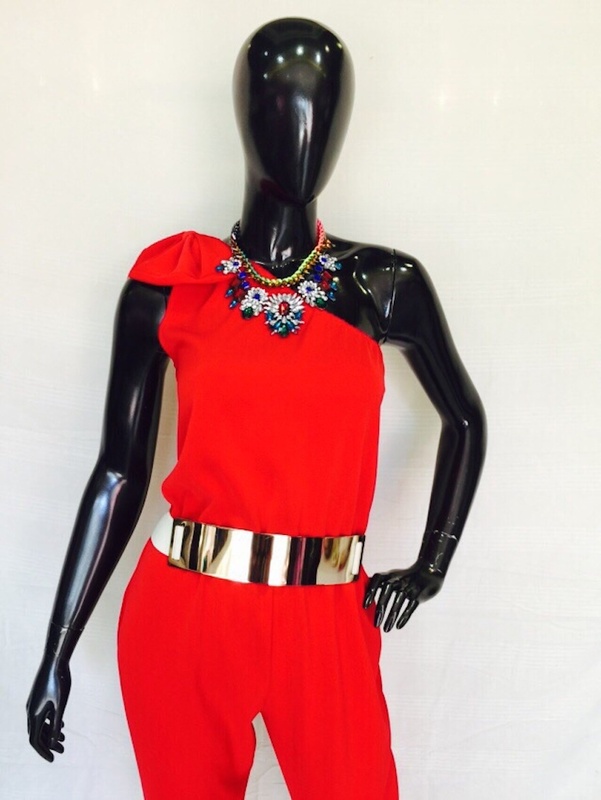 Lux has brought in a lot of fashion to Chennai and is a name all fashionistas like to quote in haute couture circles. She has an eye for spotting stylish wear and sources out the best of them. Lux sports style herself and true to the stylist in her , has helped many a woman reinvent her wardrobe. Sometimes bold! We chose crop tops with skirts this week. Click here : Crop tops to see 25 ways of wearing crop tops. They are just catching up in Chennai and no better time than summer to flaunt them. 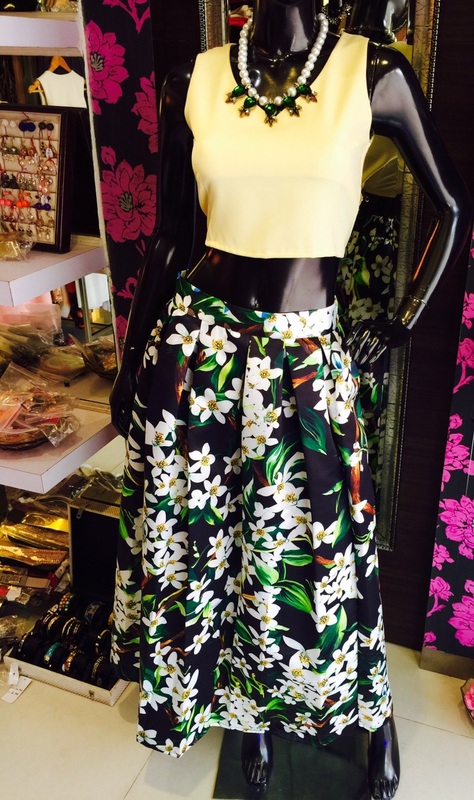 Announce Spring / Summer with this floral print ankle length skirt teamed with a smart yellow crop top. 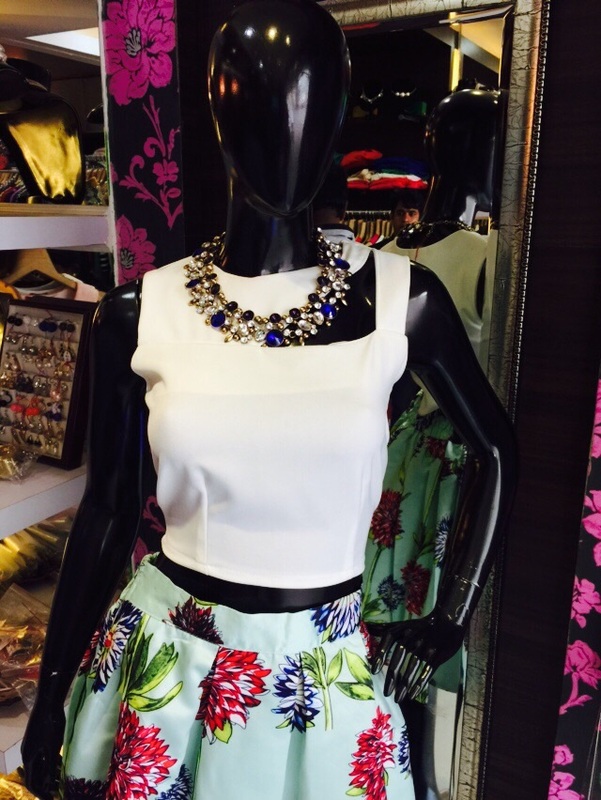 A dash of green and pearls complimenting the crop top to make it perfect party wear. 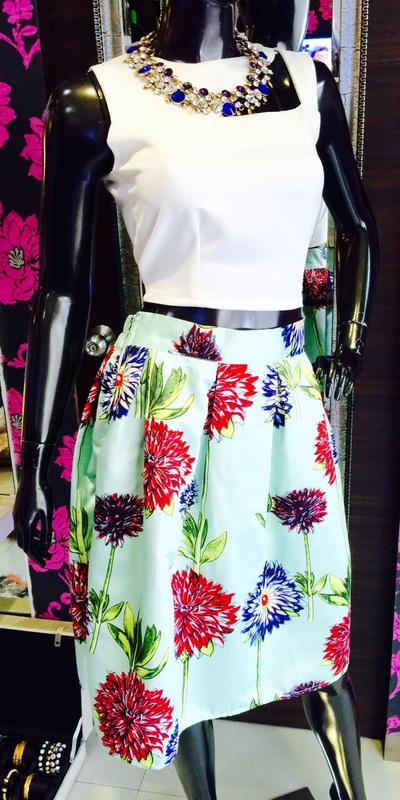 Sprinkled with blues and whites at the neck , its all set for a lunch date or a Sangeet at a wedding. Now this is my favourite. Elegant , cool and hip , the white bands adding drama and the little bow a little flirtatious. A given for a romantic candlelit evening and yes I would like to listen to Jazz in the mood that this outfit has created. 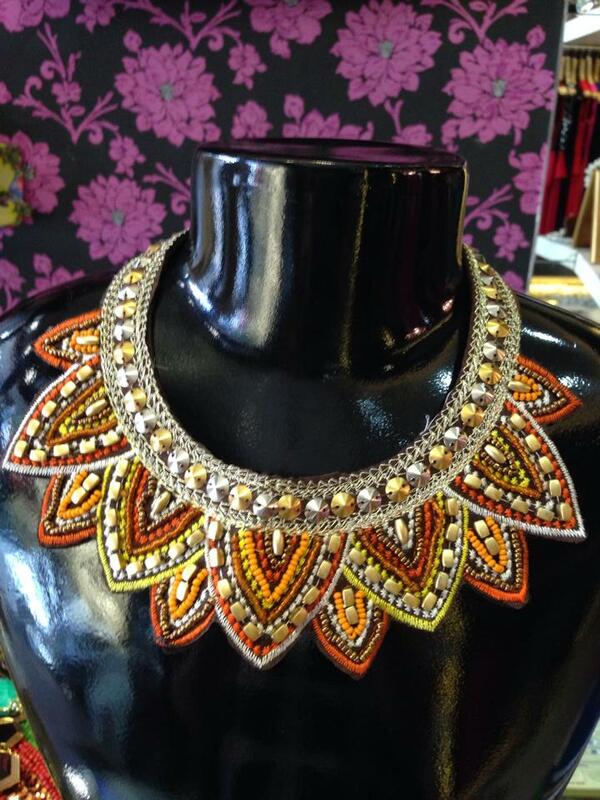 We love the Indian touch in styles from the West , making them at once more vibrant and sensuous. India is a land of myriad hues , of diversity not seen in any other land , of festivals and celebration round the year. Little surprise then that we keep reinventing fashion to pamper our folks. 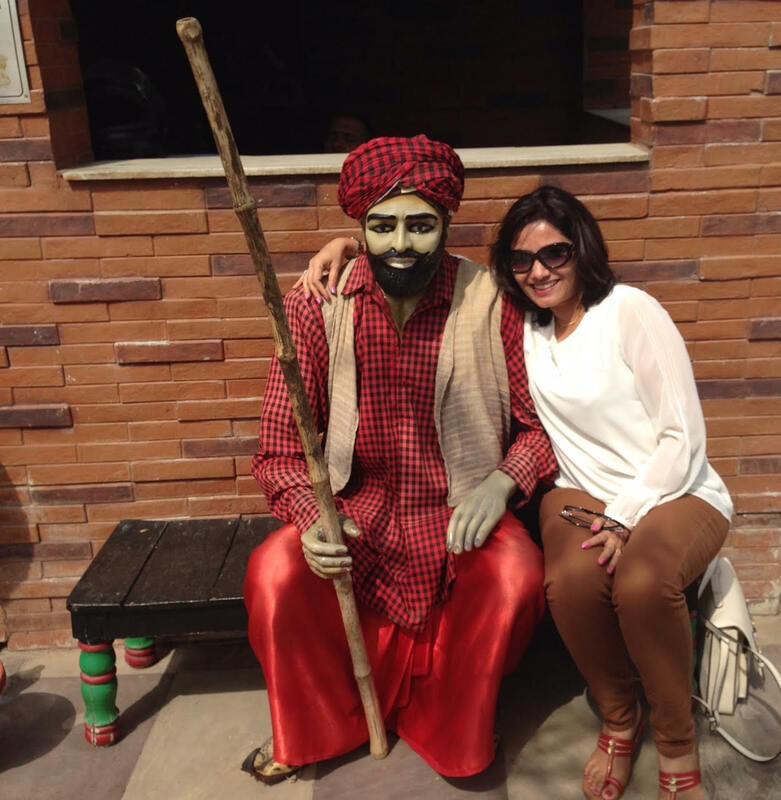 Of Holi , Bhang , Lord Shiva , Amitabh Bachchan and ………..
Our Indian festival Holi is a fun-lovers’ paradise. Its my favourite festival too. And its marked by fun , frolic , colours , food and Bhang ! Bhang is the hero of my blog post today. Watch the video for all the fun and romance at the end of this post , the song sung by the star himself to the lyrics of his father Harivansh Rai Bachchan. I would have loved to write about Holi elaborately , but lots has been written about it in WordPress itself. But just to cap it all , Holi is a spring festival , a colour festival and a love festival. Though its an ancient Hindu festival , it is now being celebrated with great gusto in many parts of South Asia and all places where we have the Indian diaspora. Holika bonfires lit in late evenings mark the beginning of the festival. Effigies are burnt to celebrate good over evil , a lot of merriment happens with song and dance and the following morning is a free for all carnival of colours. Streets , parks and most open areas are the frolickers’ playground that day , and get sprayed around with coloured water and powders . Men , women and children , age no bar , drench each other with colours and are unrecognisable by mid-morning to the accompaniment of drums and other musical instruments. Do you know , Holi unites people , fences get mended and goodwill is restored ? Where merriment is , food and drink cannot be far behind. That brings us to Bhang. Its an intoxicating potion made from Cannabis leaves and is mixed in sweets and drinks. 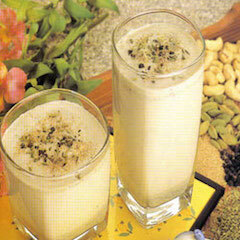 Bhang has become the epic drink of Holi. Holi is incomplete without Bhang , in being the ideal catalyst for uninhibited camaraderie. 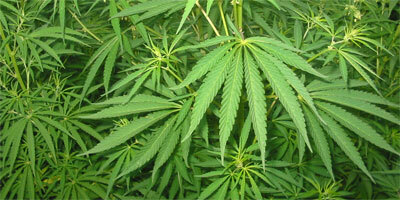 In many parts of India , Government authorised shops selling Bhang spurt up during the period. The fun potion is supposed to be an anxiety releaser and is believed to fight depression. It has a lot of medicinal uses , but we are in fun mood and shall only talk about that. We mortals are not the only ones to delight in Bhang. 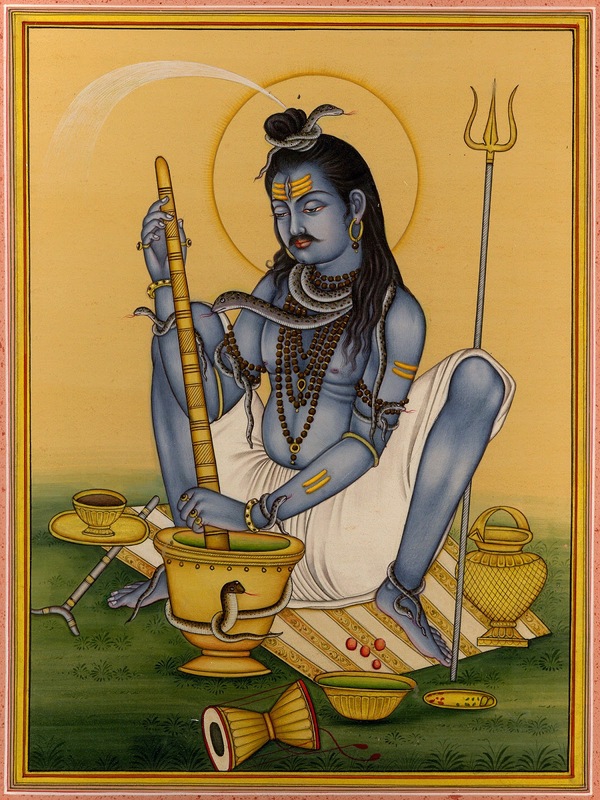 Lord Shiva is believed to have discovered the transcendental powers of cannabis and thereupon it became his favourite holy drink. Sufi mystics consume it too , they believe it aids them in their meditation. I have flirted with Bhang a couple of years ago and the memory is still fresh and lingering in my mind. It was at a Holi party I first tasted Thandai , a delicious concoction made from almonds , milk , saffron , cardomom and sugar , laced moderately with Bhang. Tasted yummy and another glass followed transporting me into a happy zone , such a happy zone that I went around wishing all a Happy Diwali !!!!!! Diwali , by the way is a much sober festival with religious and spiritual connotations. A friend then corrected me , I laughed and wished the next friend a Happy Diwali again. She looked at my glass knowingly , but didn’t mind. It was Holi after all ! Uncontrollable laughter is another jolly effect of Bhang and I became a happy victim again. Small mercy it didn’t get uncontrollable , but yet simple questions like ‘hey , how are you’ elicited peals of laughter from yours truly. On our way back home , my driver asked for directions to drop a friend to his house , and there I was squealing with laughter ! I was concerned he might think that much lesser of me , expressed it to my husband and started laughing again ! I don’t remember when the laughing spree ended , probably after I hit the bed after I had showered and scrubbed myself clean of the yellows and the reds and the blues and the greens off me. But , all is fair in love and Holi ! And precisely why our Indian Hindi film indusrty is obsessed with featuring Holi in romances of the silver screen , of which Bhang is an undisputed badshah . A case in point out of the many would be the inimitable actor Amitabh Bachchan in high spirits under the happy influence of Bhang in the song sequence of Rang Barase Beege Chunarwaali…….. , from the movie Silsila. Our man , who is at his best in drunken scenes throws caution to the winds and flirts outrageously with his ex-flame to the discomfort of the spouses (and hell breaks loose thereafter ). The man and the song have made it an epic song of all Holi celebrations and romances. Well as Huseyn Raza puts it “There is no intoxicant more dangerous than the passion of love; intoxicating both the holder and the beholder.” What then becomes of love married to Bhang …… Rang Barase……. And in my own words…..
Bhang in strict moderation please , else the headache can make you feel sick ! Lace your stomach with a few healthy snacks before and after you consume Bhang. Do not mix it with alcohol. It can give an added kick but can be fatal too. ♥ Herbal cure: Have a cup of herbal tea like rose tea or jasmine tea; it can alleviate the headache and help counter the effects of bhaang. ♥ Lemon water: Lemon water with its vitamin C is a great source of antioxidant , it helps prevent the formation of free radicals. ♥ Hydrate your system: Flush out the intoxicants with lots of water, dehydration can make the hangover worse. Happy Holi once again !